I was kind of serious the other day when I said of Fr. Calloway's book, "Read it. Buy it. Buy copies to give to others. Buy copies for others to give to others." I'll follow my own advice. 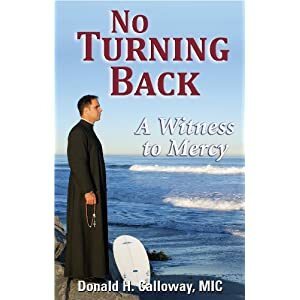 I'll give away a copy of No Turning Back: A Witness to Mercy. As in, it's free. This takes Free Friday to a whole new level. Winner will be randomly selected next Thursday, May 20th @ 9pm PST (midnight Eastern), and I'll post the results next Friday. What's your favorite book for spiritual reading? Good luck! (Considering the small readership, your chances for winning should be fairly good). Wow, thanks Angele!! My favorite book for spiritual reading so far is Abandonment to Divine Providence by Fr. Jean-Pierre de Caussade. I had it recommended to me by my confessor a while ago, and it is the most fruitful book I've ever found--truly one of those that I've thought of buying for my friends and actually did give my mom as an Easter present. In one of those great coincidences that happen in life (or serendipity, as Stephen likes to say), my boyfriend Stephen had also read it a while ago and it's one of those topics we come back to, how to be abandoned to God's will while at the same time recognizing our own agency and intelligence. :) Speaking of free, I just discovered you can read sections on Google Books (different translation from the one I read, though)! "How to Change your Husband" by a "Friend of Medjugorje" was an amazing book about how to be a good wife - which is kind of spiritual reading since it deals with the essence of my vocation. I've given many copies of it away (at weddings!). Unfortunately, I haven't been doing a whole lot of reading of anything not related to coursework. But my favorite book for spiritual reading has always been, and remains, the Bible. It allows me to connect my work to my spiritual life. And as wonderful as devotional and other such books are, they don't do nearly as much for me as reading the Scripture does. My favorite book, but super hard to read is Theresa of Avila- the Interior Castle. Oh, that's a hard one. Abandonment to Divine Providence, Heliotropium, This Tremendous Lover, Introduction to the Devout Life, Divine Intimacy, the Imitation of Christ...all of them have had a real influence on me. But one little book I always return to for prayer and meditation is My Daily Bread, which seems based, stylistically, on the Imitation of Christ. It is the most useful of all the books mentioned above, with Introduction to the Devout Life being second. I think mine would have to be the Bible... Pope Benedict's "Jesus of Nazareth" is really excellent too. Well, I think the Bible is a solid answer but if I had to pick a book other than the Bible, I'd say the Diary of Saint Faustina. It is such a rich, wonderful book. Thanks for hosting this and the chance to win. God Bless! I really enjoy "Introduction to the Devout Life" by St. Francis de Sales. Even though it was written 400 years ago, it is still so relevent! I love my Bible. I typically just open it and start reading. Even if the part I read that day doesn't speak to me right away I've always found that by the end of the day it was the perfect thing for that day. My favorite spiritual reading that I have seen make a difference in my life has been the Diary of St. Faustina. I have lived the wisdom in those words and seen how instrumental Divine Mercy has been in my life in so many ways! Dearest, I believe that two of my favorites are the Book of Psalms and Sr. Faustina's Diary. Fulton Sheen's "Life is worth living," was especially good. What a great idea...not only do your readers get to enter the giveaway, but the rest of us get to add to our ever growing pile of books we want to read :) Such a tough question too! I think, besides the obvious choice of the Bible, I'd have to say Matthew Kelley's Rediscovering Catholicism. I frequently found myself quoting parts to my DH, who eventually decided to read it himself!